A Walkway of Honor has been unveiled in Danbury. Over the weekend veterans from World War II, Iraq, Afghanistan, Korea and others gathered at the War Memorial for a dedication. Mary Teicholz, whose husband spearheaded the project, says there was a great turnout. Celtic Cross Pipe and Drums played, the Danbury Police Honor Guard did a 3-volley salute and the national anthem was sung before the 254 bricks were unveiled. 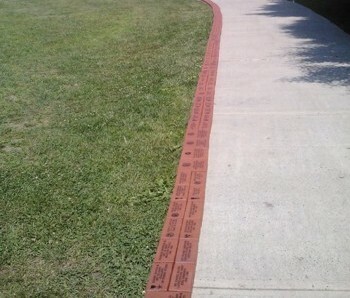 The bricks are engraved with the names of honored men and women who have served in the military. In addition to the pomp and circumstance of the day there were some speeches. Donations were made to the Wounded Warrior Foundation, Operation Vet Fit and Help Our Military Heroes. Orders are being taken for Phase Two. Bricks can be ordered at the Danbury War Memorial or via an online form.